The marriage of activism and the therapeutic process has been on my mind constantly. Perhaps that’s why I’m seeing so many examples of it lately, but I hear others remarking on it, too. We seem to be experiencing a major boost in raw feminism as of late. This particular public announcement of self-reflection and healing was such a display of activism that I couldn’t help but write about it. 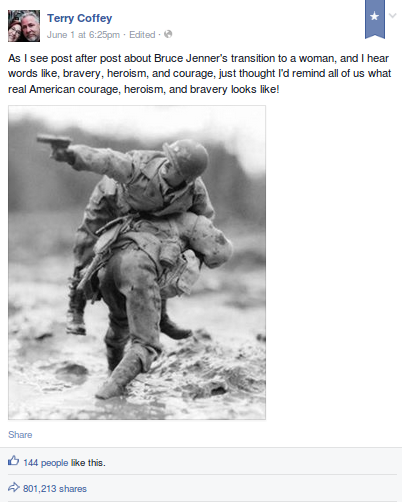 It was a sentiment shared by many, who seemed to feel that the term “hero” being applied to Jenner negated other uses. It’s not an uncommon belief that the only true heroism comes in the form of facing physical danger, preferably war. What a beautiful example this is of the therapeutic process of tuning in, self-reflecting, and practicing something more authentic. When Coffey educated himself on the history of the photograph he’d chosen, he must have had many, many sensations and emotions arise. I am very impressed with how honestly he listened to them. He let those feelings guide him to a new way of seeing things. And then he immediately and publicly exacted change. So not only do we get to hear about this incredible (and quick!) journey, but we get to be inspired by his process, which can in turn affect our own self-understanding. When I saw Coffey’s follow-up posting, I didn’t feel surprised. I felt relieved. 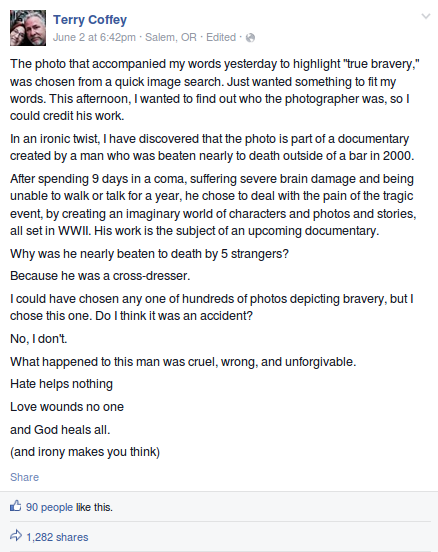 I had that lovely grounding sensation in my stomach that a deep truth can bring. This is what can happen when someone unpacks their beliefs. Love comes springing forward. We probably don’t get to know what factors in Coffey’s life led him to react with that initial post, nor do we know where he’ll go from here, but the gift of witnessing his experience will remain. And there’s so much power in the fact that he will reach people who may otherwise not be exposed to such a change of tune, or those who would discount his second sentiment if it came from The Opposition. Interestingly, the sentiment isn’t actually that different. It’s just more inclusive. Transpeople are risking their lives for their freedom.